There is one word that means the same thing across the globe: pizza. It’s one of the few foods that’s great at any time of the day or night. Chicago was recently named the “best restaurant city in America,” and rightfully so. 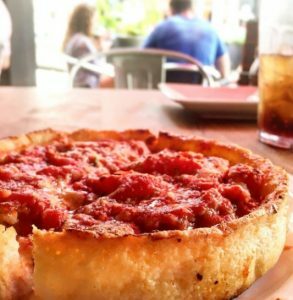 When you mention food in the Windy City, one of the first things to come to mind is the famous deep-dish pizza. It would almost be a crime to make a trip to Chicago and not stop at one of the many authentic deep-dish pizza parlors. So put your gluten-free diet on hold and budget your calories to experience a Chicago staple the way it’s supposed to be enjoyed! The debate over Chicago’s best pizza will likely go on forever. Be that as it may, Pizzeria Uno, founded in 1943, makes a strong case for being placed among the city’s finest. 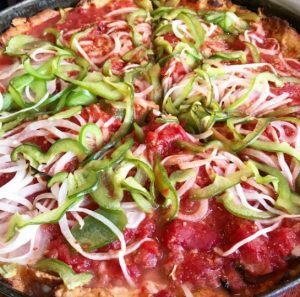 Many consider this spot to be the pioneer of Chicago-style deep-dish, and the atmosphere certainly reflects that notion. Boasting its signature flakey crust and delicious crushed tomato sauce, a meal at this iconic pizza landmark will surely leave you and your group in a food coma. With options for shipping, you can enjoy this delicious pizza in the comfort of your own home nearly anywhere in the United States. Known for its crispy edges and caramelized cheese, Pequod’s Pizza is widely considered one of Chicago’s elite pizza joints. Founded in the 1960’s, many of Chicago’s faithful pizza connoisseurs would argue this parlor serves the best slice in the city. Pequod’s is a topnotch dining/bar experience from the moment you walk in the door. The staff is incredibly helpful and the atmosphere oozes with Midwest friendliness and Chicago pride. The wait can be long if you stop by on a weekend, but it will all be worth it when the server plops the pie down on your table! Placed in the heart of downtown, Giordano’s is renowned for its over-the-top take on deep-dish pizza. Consuming a pie here is not for the faint-hearted. 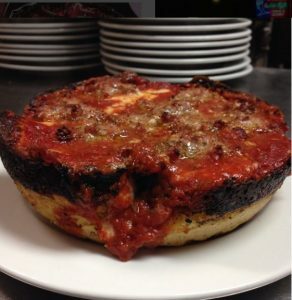 Legend has it a signature deep-dish pizza weights nearly 3 pounds! Even though the hard-hitting “go big or go home” attitude is present in every meal, the place’s ambiance gives off a cool and casual vibe perfect for a friendly outing. Just be sure everyone in your group brings their best appetite, as it takes an army-sized hunger to demolish one of these pies. 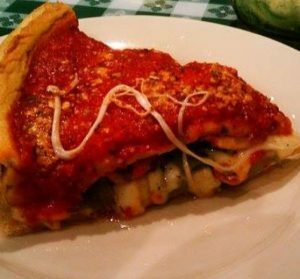 For out-of-towners, Giordano’s will ship their product almost anywhere in the U.S so you can enjoy it anytime you want! Pizano’s versatile menu ensures even the pickiest of eaters will leave satisfied. 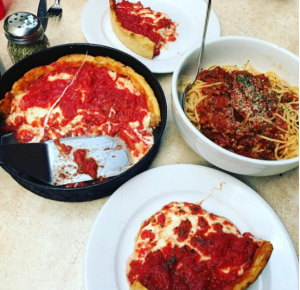 With grounded values in traditional recipes and ingredients, this Chicago pizza joint is always a reliable choice. The deep-dish itself is known for the crunchy crust and mouthwatering sauce. The friendliness of the staff and warm atmosphere is second to none in the city. Regardless of whether it’s your first time dining here or your millionth, every customer is treated like a family friend. Pizano’s famed product can be shipped from coast-to-coast. While it seems like there is a pizza place on every corner in Chicago, Bartoli’s Pizzeria really goes the extra mile to stand out. The experts at this shop have perfected the practice of creating a hearty crust without using a ton of grease and oil. Perhaps the highlight of the pie is the homemade sauce; crafted with a one-of-a-kind blend of Italian herbs and spices. No matter what you choose to put on your pizza, you made the right choice! 6. Chicago Pizza and Oven Grinder Co.
Of all the pizza joints in the city, Chicago Pizza and Oven Grinder Co. might have the most interesting take on deep-dish. What they do is take the classic pie, and turn it upside down. 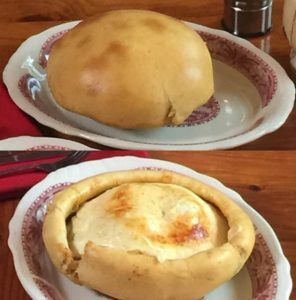 The result is a heavenly pot pie-like bowl filled with layers of cheesy deliciousness and your choice of ingredients topped with homemade crust. 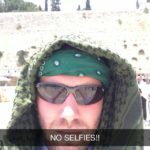 As a first-timer, you might be a bit puzzled upon first glance, but you will definitely not be disappointed. One of the most important things to note about this place is it’s CASH ONLY – so be sure to hit the ATM before stopping by. 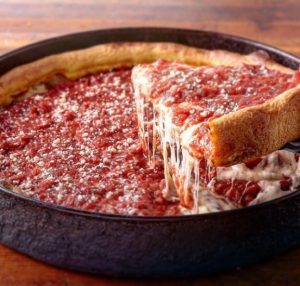 Gino’s East found their formula for deep-dish pizza half a century ago and haven’t looked back. 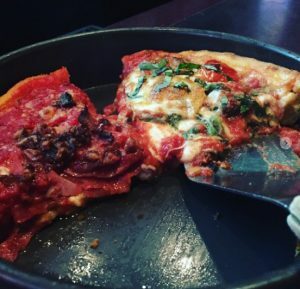 The top-secret recipe for their delectable crust, combined with high-quality ingredients and luscious mounds of mozzarella cheese, makes this parlor a must-stop location in any Chicago itinerary. Since the pies are slow-cooked to perfection, it’s a safe bet you should expect a wait of 45 minutes to an hour for your food to come out. The small and quiet atmosphere makes Gino’s East a great spot for a relaxed, low-key meal. Perhaps the best part, the pizza is just as good the next morning as is when the server puts it on your table! Pizzas can be shipped anywhere in the United States. 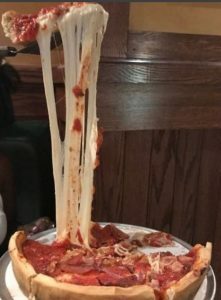 Priding itself on all-natural ingredients from top-to-bottom, Edwardo’s Natural Pizza has been carefully establishing its notoriety in the Chicago pizza scene since 1978. Time and time again, this joint has been noted by critics as a favorite stop on a tour of the Windy City. The service is outstanding and the restaurant gives off the comforting aura of a classic American diner. If you stop here during the daytime, you can eat your way to a nap at the restaurant’s famous lunch buffet! Edwardo’s pies can be shipped nearly everywhere in the United States. This entire list might be deemed a failure if we don’t mention Lou Malnati’s. When you’re staying in Chicago, getting a deep-dish, nap-inducing pizza at this place is a must! Since its opening in 1971, they live and breathe by the philosophy that “keeping it simple” yields the best results. This mindset has propelled the restaurant into the highest class of Chicago pizza places. The rich buttercrust, ample toppings, and crushed tomato sauce have spawned one of the most loyal food followings in the entire city – maybe even the entire country! Many would argue you haven’t truly experienced Chicago deep-dish until you dine here. 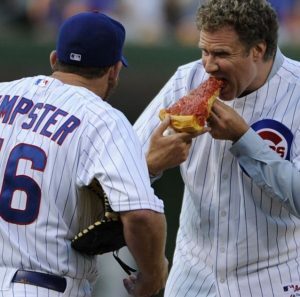 As one of the pillar items in the Taste of Chicago lineup, Lou Malnati’s will not disappoint. Available for shipping nationwide. Regardless of how delicious pizza is, you can only eat so much without hating yourself… That being said, it’s inevitable we’ve left out a few of Chicago’s many famed pizza parlors. Feel free to let us know of any standouts we may have missed and we will get the wheels turning for a part two!